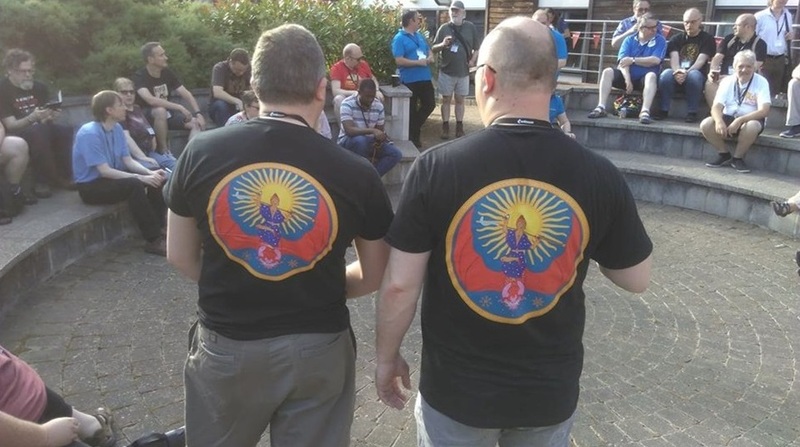 Favorite roleplaying club: Some British Glorantha fans recently founded the Rune Masters, a collective of GMs for all sorts of gaming in Glorantha. What a great idea, and what great t-shirts! (glorious Glorantha art by Dan Barker). Favorite book: Given I am helping work on the new edition of Credo, the “game of dueling dogmas”, my favorite book right now is the Panarion of St Epiphanius, passed on to me by Credo creator Chris Gidlow. It’s a 4th century work, in which the forenamed saint dutifully and enthusiastically describes every Christian error and unorthodoxy he knows or has heard of, and how to refute it: hence its unofficial title, “The Big Bumper Book of Heresies”. Favorite role-playing game: RuneQuest. Pendragon and Call of Cthulhu are close seconds. Favorite boardgame: Khan of Khans and History of the World – because of the six-eight hour running time, this is a favourite ‘holiday’ game that we regularly play with friends. Favorite wargame: Not really a wargamer! Juegos y Dados – Welcome Michael, thank you so much for your collaboration. It is a pleasure that you are here with us. MOB – Thank you for having me! MOB – Like many other roleplayers of my generation, the first RPG I ever played was Dungeons and Dragons – the blue box edition. It was 1979, and I was in my second year of secondary (junior high school). MOB – Basic D&D was the first RPG I played, but the first roleplaying game I owned—as in went to a game store and bought myself—was TSR’s Wild West game ‘Boot Hill’. But by the time I owned that me and my junior high school friends we were already enchanted by another game to play Boot Hill much. That game? RuneQuest! Everything changed for me when one of my gaming friends brought an intriguing yellow book to school. 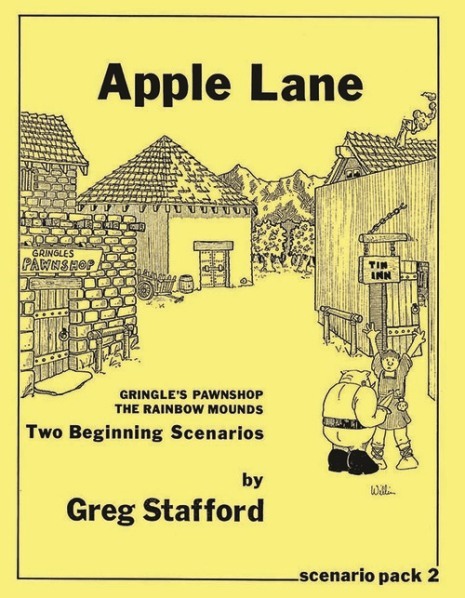 This was of course Greg Stafford’s “Scenario Pack 2” Apple Lane. We didn’t actually own the rules, so had to work out RuneQuest from first principles and what we knew of D&D. But it was weird – what “level” was Gringle? How do you calculate Quackjohn’s armour class when this game has hit locations – cool, you could cut off someone’s arm (or, as we soon discovered, get your character’s arm cut off too). We eventually got our hands on copies of the rules (RQ2), and I’ve never looked back. I did own a copy of the now immensely collectable and endearingly typo-ridden RuneQuest 1st Edition once, but gave them to a friend who didn’t have any copy of the rules. 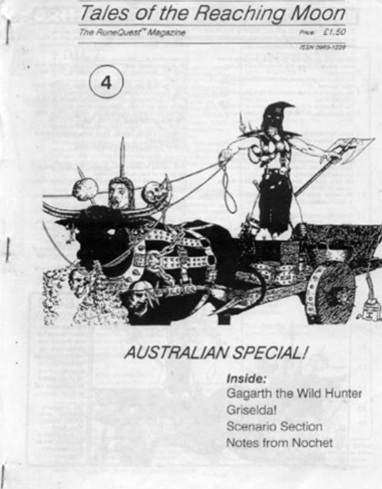 Juegos y Dados – You took part in Glorantha Fanzine Tales of the Reaching Moon a lot of years. What could you tell us about this? 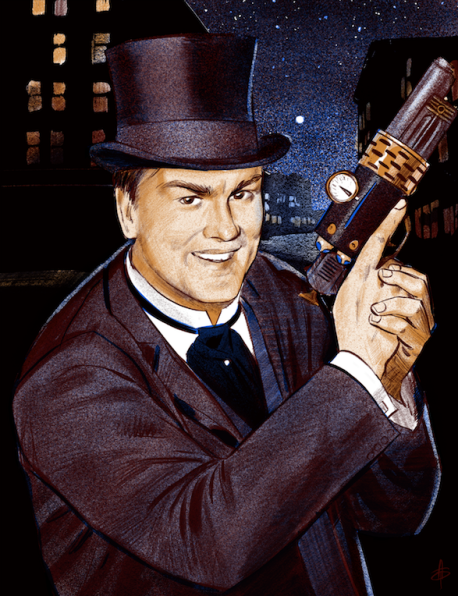 MOB – Tales of the Reaching Moon had a very influential role in keeping Gloranthan fandom alive in the 1990s and early 2000s, and for that we all have to be immensely thankful to David Hall, the founder and editor of the magazine. It was my privilege work alongside David as associate editor from issue #4 onwards, and through that magazine, I am fortunate to have made gamer and Glorantha friends and creative partners all over the world. Here’s how I got involved with Tales. David was in the UK, and I was in Australia, and we didn’t have the Internet in those days (1989). But I had had some articles accepted by White Dwarf magazine, which at one time included excellent RuneQuest coverage, starting with Mike Cule’s wonderfully freeform scenario Rumble at the Tin Inn in WD #33. Unfortunately, by the time my material was all ready to go, WD took a new editorial direction, exclusively covering its own Warhammer line going forward and nothing else. So my RQ stuff never appeared in WD. But fortunately for me, when Jon Quaife, the RuneQuest editor at White Dwarf, wrote to tell me the bad news, he included a copy of a new British fanzine that he said might be interested in my work instead. 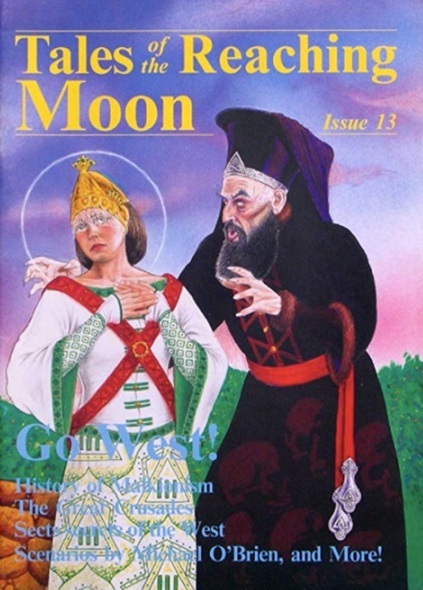 That fanzine was Tales of the Reaching Moon issue #1. I jumped at that opportunity, and by issue #4 was part of the editorial team. Later on my friend and Chaosium colleague Rick Meints also joined the editorial team. Juegos y Dados – Could you tell us the story of Gorp #1 (Summer, 2000)? MOB – So, Gorp. This is, as you say in your intro, a fake fanzine, purporting to be a rare collectible from 1982. I am the culprit. What happened is this. Auctions used to be a big thing at some game conventions I regularly attended, including Tentacles in Germany and Convulsion in the UK. If I was invited as a special guest, I would try to bring along something rare or special or even unique to donate to the auction: then whatever funds were raised could help the organisers meet expenses. But after doing this for half a dozen or so conventions, I started to run out stuff to donate. But I had a (evil) brainwave, I could create a rare collectable! I immediately roped Greg Stafford, Ken Rolston and David Hall into the conspiracy, asking them to each write me an article as if they were 18 years younger, in 1982. Which they all cheerfully did. If I recall, Greg’s is “Gorps as Player Characters”, David’s was “Hayward the Pickled Onion” (a chaos monster that also featured in Tales #1) and Ken’s was a scenario involving dragonewts that is actually awesome and if I ever find it, will update for RQG. But even with all that “quality” material, I was still a lot of pages short of a fanzine. So, even though it called itself “Gorp – the RuneQuest Magazine”, I added a special “Traveller” section, using some material from a homebrew campaign I played in as a teenager, and then padded out the last 16 page with part two of a TRS-80 computer program with the tantalising title “Kakstan’s Art Museum” (a location in the Big Rubble). The issue ends with a bogus cease and desist letter from AH, to give a plausible explanation why GORP ceased after issue #2. 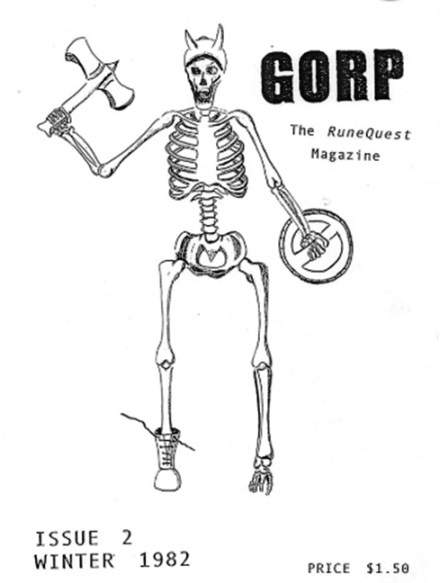 (Yes, I created GORP as issue #2 –maybe one day when I have another convention to go I will have to create GORP #1, Winter 1981 and rope in some writers to write me an article as if they were 37 years younger…). MOB – This isn’t a story of a famous designer I met, but the person is famous nonetheless, and I can relate to the experience. 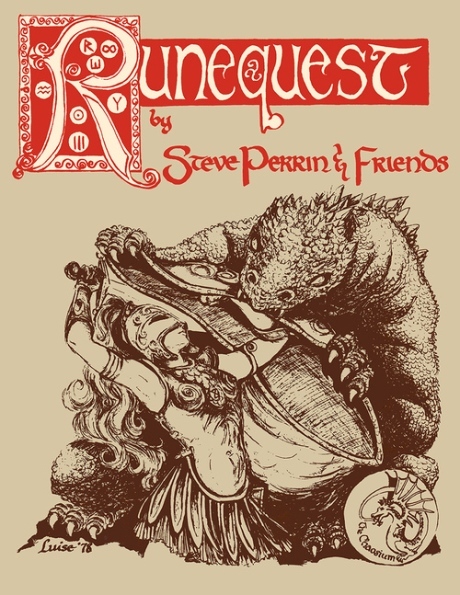 Long ago, a 13 year old kid called Reid Hoffman turned up unannounced at the Chaosium office in Oakland one day and proceeded to show Steve Perrin a much annotated copy of the RuneQuest rules and all the things that could be done to improve the game. Steve didn’t kick the presumptuous kid out; instead, after looking at his notes, he hired him to review and edit the newest RQ release they were working on – Borderlands. And so when that product came out in 1983 the HOFFMAN on the cover—in the company of famous game designer names like Greg Stafford, Steve Perrin, Sandy Petersen and the like—is that 13 year old kid. 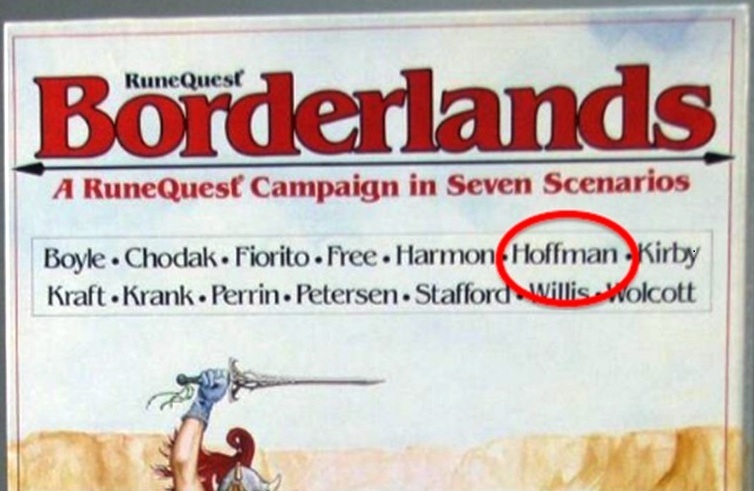 I was 17 and an aspiring rpg writer myself when Borderlands came out, and would have been intensely jealous to know that the HOFFMAN was just a kid, younger than me! That Reid Hoffman went on to become the founder of LinkedIn and is now one of the wealthiest people in the United States. But in podcasts and interviews Reid Hoffman still makes mention his early work (and first paycheck!) at Chaosium as a foundational experience in his journey to where he is today. And he backed the RuneQuest Classic Kickstarter. Juegos y Dados – We interviewed Sandy Petersen and Greg Stafford months ago and Rick Meints and Jeff Richard recently. They are nice people. Could you explain us any fun story? MOB – I remember when my wife Susan met Greg Stafford for the first time. They are now great friends, so much so he has explained to her the God Learner Secret. But at the time she whispered to me “He’s got bones hanging off his leather jacket”. Which indeed he did. Robin Laws didn’t call Greg “the Grand Shaman of Games” for nothing! Juegos y Dados – What did you feel when you formally became Vice President of Chaosium? MOB – I formally joined Moon Design Publications at the end of July, 2015, literally one day before Moon Design became part of the ownership and management of Chaosium. Rick, Jeff and Neil had been in discussions about this with me for some months, but all the places fell into place on that final day. How did I feel? Amazed, excited, and perhaps a little apprehensive: none of us were exactly sure what we were getting ourselves into, other than we knew Chaosium was pretty terrible shape. However, I am appreciative and thankful that I now have a job I always dreamed about, and that couldn’t have happened without my partners and friends Rick, Jeff and Neil deciding the Moon Design management team and ownership would be better served with me as part of it. And for that I will always be grateful to them. MOB – My favourite Chaosium game is RuneQuest, without a doubt. I’m so glad I discovered RQ in my early teens, or perhaps thankful that friend of mine got his hands on that copy of Apple Lane! And I’m going to say my favorite game is Khan of Khans – waha! MOB – I love the d100 system as it is easy, quick, intuitive and coherent. I also love that if you’ve played one of the d100 games, it’s pretty easy to figure out how to play any of the others. By contrast, last year, I took part in a 12 session organized play style campaign that used one of the popular d20-style rules systems. As part of that we “leveled up” each session. The rules bloat as the characters progressed kept getting more and more complicated and contrived, and I felt it got in the way of actual roleplaying. And I deliberately played as vanilla a fighter as I could, in the hope I wouldn’t have to go as deep with the rules. Don’t get me wrong – I had a lot of fun, but I actually think the rules got in the way of that enjoyment, rather than help facilitate it. MOB – At the moment I am playing in a regular RuneQuest – Roleplaying in Glorantha campaign, using the newly released rules. My good friend Andrew Bean is the GM, and my wife Susan (Chaosium’s board games line editor) and other old friends are the players. We’re playing the brilliant The Coming Storm/Eleven Lights campaign from HeroQuest: Glorantha, adapted for RuneQuest. This is an incredibly rich and deep campaign that has received rapturous and well-deserved critical acclaim. Fortunately anything written for HQG is very easy to adapt for RuneQuest, and we (Chaosium) are looking at offering conversion materials for just that as The Coming Storm/Eleven Lights deserves a big audience. I am also a semi-regular in Call of Cthulhu campaign playing through Horror on the Orient Express and some one-shots of our own devise. Juegos y Dados – You publish different products around Call of Cthulhu like Cthulhu for beginning readers and Cthulhu The Coloring Book. In my view, Chaosium is one of the most specialist brand in Lovecraft’s products. What do you think? MOB – Yes, you’ll see acknowledgement in both in literary and academic spheres of the Call of Cthulhu roleplaying game’s important role bringing the Lovecraft Mythos to a wider audience. I don’t believe “Cthulhu” and “Lovecraft” would be the popular culture phenomenon it is today without Call of Cthulhu. I have an interesting connection with both Call of Cthulhu for Beginning Readers and Call of Cthulhu the Coloring Book. The coloring book came about when I saw an article in Tor.com showing off a Russian artist’s Lovecraftian art with the comment “Wouldn’t this make an amazing coloring book”? I agreed, tracked down the artist Andrey Fetisov, who didn’t even know Tor has featured his art, and got him working on the coloring book (which we ended up winning a Gold ENnie for, btw). When we became the new management at Chaosium in 2015 we discovered that although Call of Cthulhu for Beginning Readers had been contracted years before, and the creator had dutifully turned in the finished manuscript some time ago, he’d never been paid. We wanted to rectify that right away, but the creator, the “genius poet-artist” RJ Ivankovic (as Geek and Sundry later described him), proved to be difficult to get in touch with. Then I discovered he lived in Melbourne, Australia, literally less than 10 minutes’ drive from house! 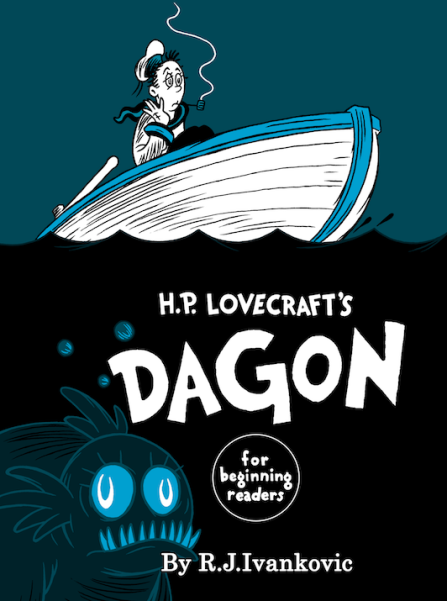 BTW, RJ is bringing out a second “Beginning Readers” book, to be released later this year – this time Dagon is getting the masterful treatment and anapastic tetrameter. Juegos y Dados – Jason Durall has recently formally joined the design team for Chaosium’s new edition of RuneQuest RPG. I think you are preparing the RuneQuest Gamemaster Book. What could you tell us about this? MOB – Here’s something special that’s going in RuneQuest Gamemaster Book: rules for playing a Hero. The original RuneQuest tantalizingly said that this was the aim of the game – for your characters to progress from initiate to Hero, but the rules stopped at Rune Lord/Rune Priest. And although various planned releases were mentioned, nothing ever came out enabling RuneQuest players to take that next step. That is going to be rectified in the Gamemaster Book. I have been involved in playtesting the new rules, and I think they are a seamless and long-needed addition to RuneQuest. And yes, it is great to have Jason on board as our RuneQuest line editor with his dept of experience as a writer and designer! Check him out GMing RQG combat with our friends Encounter Roleplay here – speaking of Heroes, the time of that actual play broadcast was 2.30 – 5.30AM in Berlin where Jason was (and Jeff, when the GMed the earlier session). That’s pretty heroic to me! MOB – Yes indeed! We have many exciting things in development at Chaosium – some which we can talk about, and some which will have to wait until a later time. 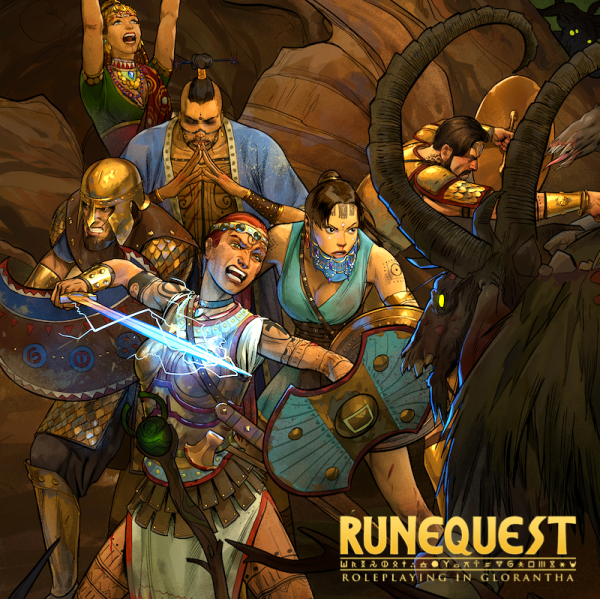 For roleplaying games, we’re of course right in the midst of getting the new edition of RuneQuest into release. We’re delighted with the response the game has received. We’ve air-shipped some copies of the core rule book so we can show them off at Gen Con. The PDFs look wonderful, so I can’t wait to see the physical book! Another wonderful looking RPG book we’ll have out soon is 13th Age Glorantha. This has been released in PDF, and the physical copies are on their way to the Kickstarter backers, and will then follow in general release. The authors of this book are Jonathan Tweet and Rob Heinsoo. 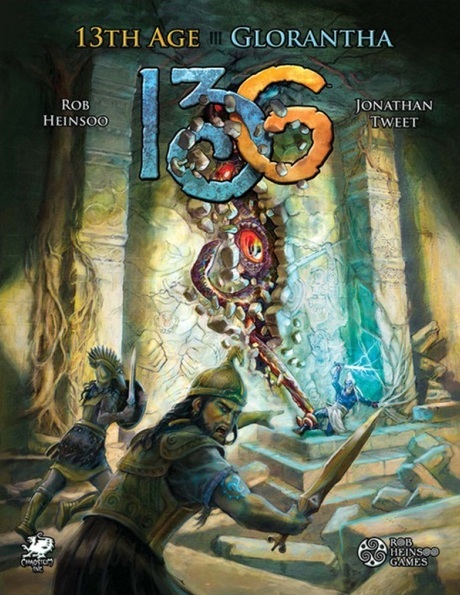 Jonathan and I were part of the team for a RQ3 product back in the day, Strangers in Prax, and I worked with Rob to do the art direction for 13th Age Glorantha. It is a beautifully written book – described as a “love letter to Glorantha by the designers of D&D 3rd and 4th editions” – and looks beautiful too. Glorantha really comes to life with through the art, and you will see many of the same artists have pieces in RQG too. In fact, we decided one of Andrey’s 13G pieces was so awesome we repurposed it for the incredibly striking cover of RQG. Speaking of boardgames, my wife Susan O’Brien is Chaosium’s board games editor. She brought out Khan of Khans last year, working with Reiner Knizia and Greg Stafford (there’s a unusual pairing!). 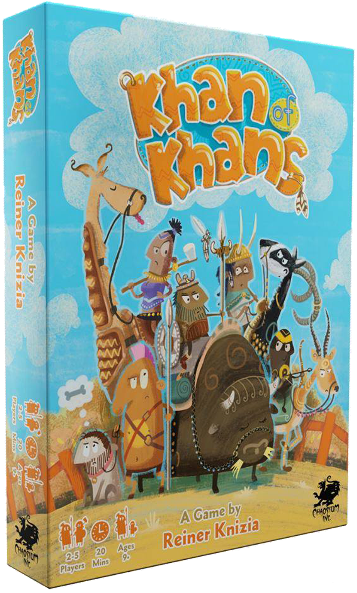 That was Chaosium’s first board game in a quarter of a century, so it was very pleasing for Khan of Khans to be nominated, and winner, for not one but two ENnies in the 2018 awards. A game we’re currently working on is Red Thread of Fate. This is a cooperative, narrative game set in 10th century Japan. It involves classical poetry, uniting lovers, and the henge, traditional Japanese shapeshifters. Red Thread of Fate won the 2017 Game Chef Award, and was created by the extremely talented Brazilian/Icelandic designer Pedro Zivani. We were also delighted to have had advice from Nobuaki Takerube (“Tak”) of Arclight (Japanese publishers of Call of Cthulhu. Tak has also written an introduction to the game and its supernatural elements. 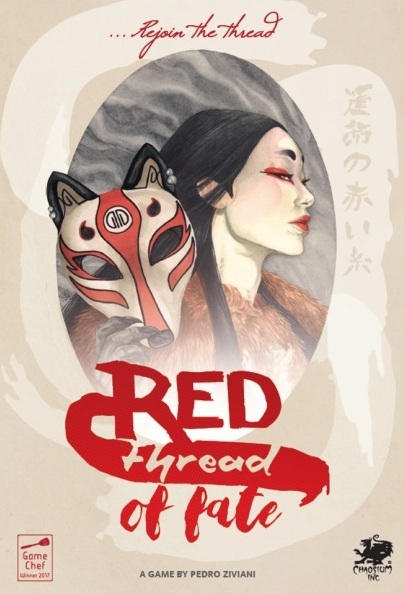 The art and design for Red Thread is incredibly gorgeous too: Susan has been working with Australian graphic designer Liz Gridley, and Japan-based artist Kat Birmelin. MOB – I am pleased to use this opportunity to thank Chaosium fans for their long-standing support and loyalty. It’s been a hard road getting the company back on its feet (and we’re still not quite there yet), but we couldn’t have done it without Chaosium fans’ support. MOB – It was a pleasure!